Often when in a hurry, I'll render out composit shots from my 3D software once the main lighting and surfacing are working rather then spend time rendering passes and compositing them. Today I was thinking - one thing that often helps integration with a photographic plate is applying some light wrapping. 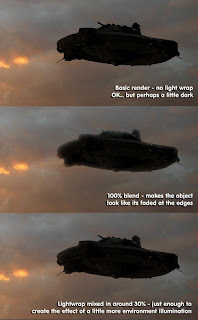 Its a process that is common in compositing - but what about throwing that idea into a 3D application's rendering output? 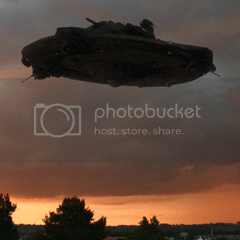 This is a quick-n-dirty render (a Valkyrie UFO from the black comedy Iron Sky, which was provided as supplemental material with the 3D application LightWave from NewTek) is lit, rendered and then light wrapped over the top of a photo taken from my house one evening. A light wrap? Is that some kind of low-cal tortilla snack? A light wrap basically creates a soft blend of a background plate over composited foreground objects. 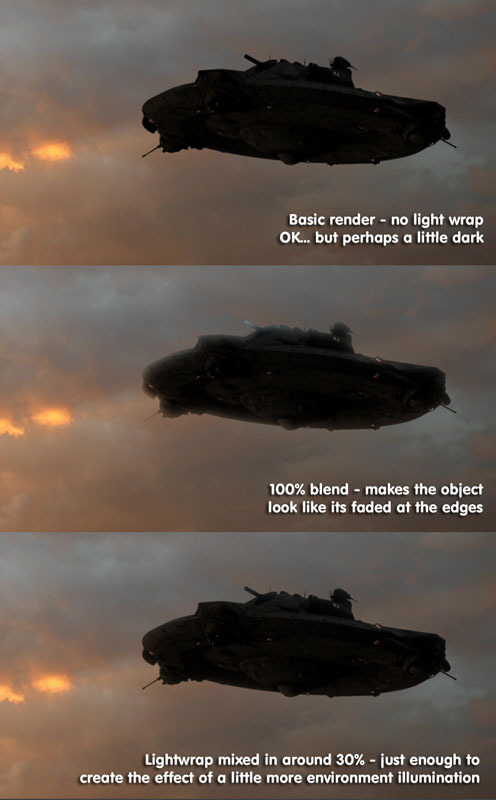 Its called a light wrap because you're basically faking the effect of lighting from your plate 'wrapping' around the edges of your foreground. Its a great way to help integrate elements, such as green screen footage, into a plate - while spill suppression and other such concepts will get you most the way, a light wrap will just help tidy things a little more. The process is to generate a soft edge mask over your element, using the alpha matte from it. This then allows that area of the background to be overlaid and create our effect. In the image below, we can see the process - starting with an alpha, we created the soft edge and then clipped this to create the final mask. Once we've got the mask - we just use it to matte the background plate, and take these pixels and screen blend them back over the top. Usually this should be mixed in just enough to boost the items so that they feel more integrated into the shot. As a note, often the background plate is blurred a little to remove some of the detailing - all we are after here is a soft light. If the image is very detailed then we could end up with a lot of detail in the light wrap, which in turn would just not feel right. As you can see below, too much of this makes the edges of the object appear transparent and faded against the background. Drop the mix and you get a much more appealing result. What's the story then about applying this effect into your 3D render? 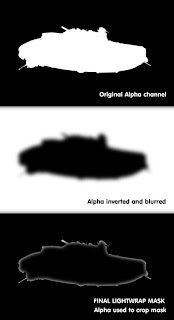 For this effect, I created the post effect using image processing filters in LightWave. It makes use of some incredibly powerful free third party tools created by Denis Pontonnier that give this 3D application a very powerful set of compositing and processing tools. So - do I always need a light wrap effect to make my work look better? 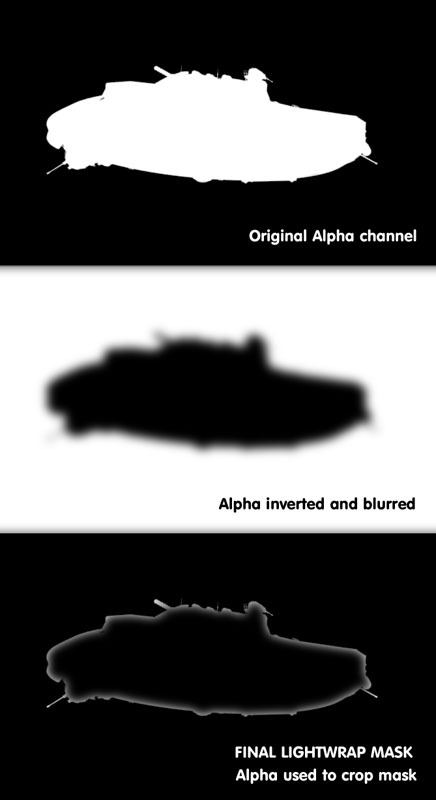 That said, as we see below, this other image below didn't need a light wrap at all. The background was fairly overcast and foggy. A light wrap works well when the surroundings are lighter or crisper - but the use of one will come down to whether you visually feel you need to include one. Its not a technique needed on all projects - but its worth understanding what and why its used. I hope has been a valuable little article and at least given some of you a little more knowledge (or at least some amount of inspiration) that you feel you can use in your art. I'm hungry! Feed me more!